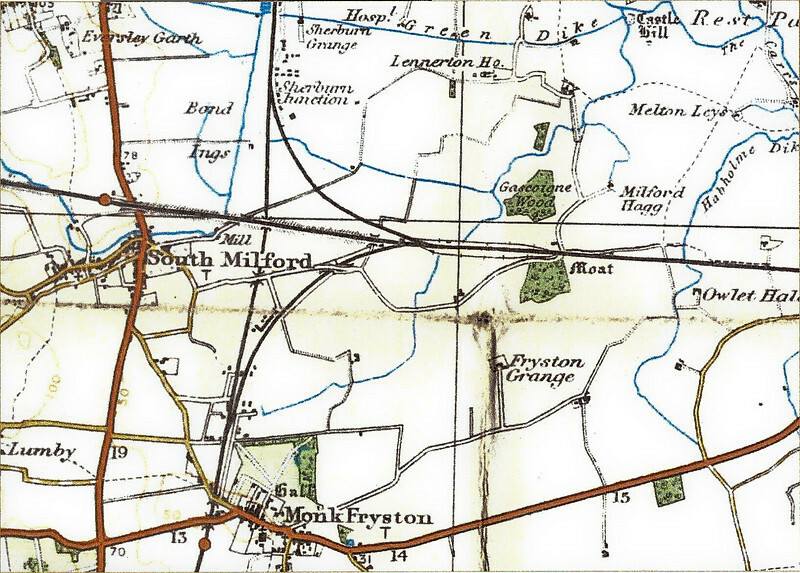 Milford Junction Map (1930's Out of copyright OS Survey Map extract) The line running vertically leads to York. The line running diagonally is the Leeds to Selby Line. Suprisingly, the main running lines shown here remain in place. Quadruple track from the south and the remainder all double track. The station near Monk Fryston has closed and what was once the Junction station (between the divergence of the York and Selby lines) is not even shown. In the 1950's, when I lived there, a footbridge still existed across the tracks which originally served the Junction station - alas, this has been removed. All I have is the happy memories of rushing along the bridge to catch the smell of the smoke of a passing steam train. This love was not however shared by my mother. I found this website very useful in providing old OS maps. I am currently rennovating the house at Milford Junction and would love to see any old photos you have.